This image, like the right side of the preceding one, comes from a “harmonic division canon”: If one takes any rectangle and draws diagonals in it, then divides the rectangle in two through the intersection point of the diagonals and draws more diagonals in the newly created rectangles, proceeding this way at one's discretion, the intersection points always produce harmonic intervals. This division canon was discovered by Hans Kayser in medieval architecture. 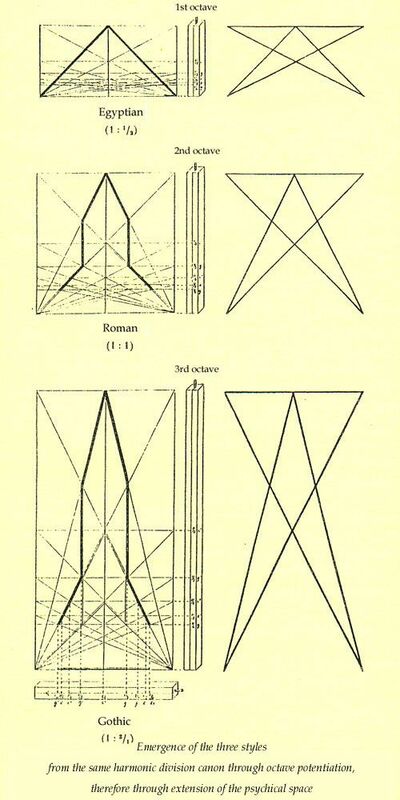 Regarding Image 10, Kayser writes: “This harmonic analysis not only gives us an idea of how the ancient architects, who were doubtless familiar with this 'rational segment division,' may have proceeded in their designs. It also gives us something far more important: an inner characterization for these three styles in relation to each other. The lengthening of the monochord-the increasing of the octave space-can be observed psychically as an enlargement of the psychical configuration space. Whereas in the Egyptian aspect, the tone-lines still adhere to the 'earthly' and allow only the pyramid as a prototypical form, Romanesque architecture introduces the 'tower' and thereby allows for basilical symmetry. In the Gothic aspect, this tower is of commanding importance and pulls all other forms upwards along with it, reaching the maximal expansion, the greatest possible upsurge of the architectonic measure as a symbol for the relationship of the earthly and the human to the divine. 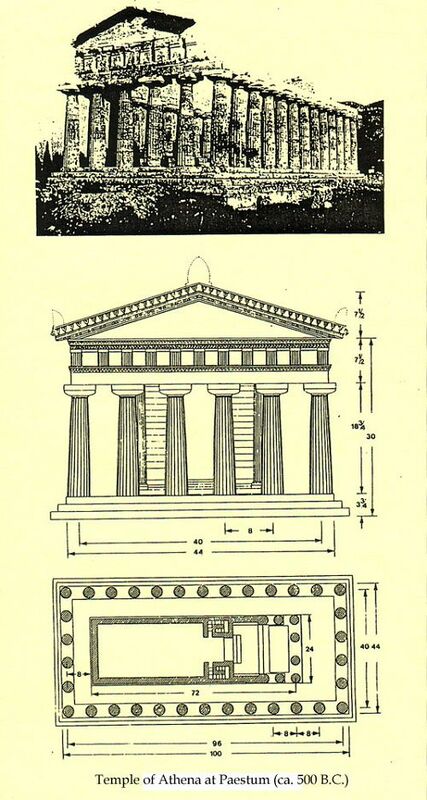 “The flourishing of the Pythagorean school, approximately contemporary with the construction of the Temple of Athena, makes it seem possible that Pythagorean speculations on numbers were reflected in the Temple's architectonic expression. The numbers of the Temple's axial measurements, 40 × 96, can be derived from the numbers of the Tetraktys (1 2 3 4), which the Pythagoreans held sacred: division by 4, the measure of half the span, yields 10 as the sum and 24 as the product of the Tetraktys numbers (40 : 4 = 10, 10 = 1 + 2 + 3 + 4; 96 : 4 = 24, 24 = 1 × 2 × 3 × 4). 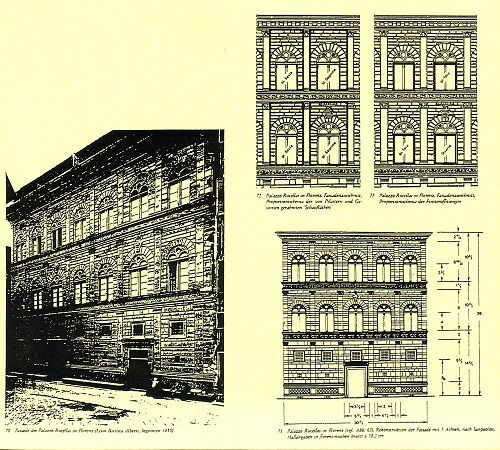 Regarding this image, Naredi-Rainer writes: “The architectural aesthetics of the Renaissance are saturated with the Pythagorean-Platonic idea that the harmony of the cosmos is built upon musical number ratios; its first and most significant verbalization was in Alberti's tract on architecture, De re aedificatoria libri decem, which was written in the mid 15th century but first printed in Florence in 1485. The fundamental aesthetic principle, the 'concinnitas,' is manifested according to Alberti in certain numbers and proportions, which appear most clearly in music. Thus one should obtain the entire law of the relationship from the musicians, who know these numbers best.